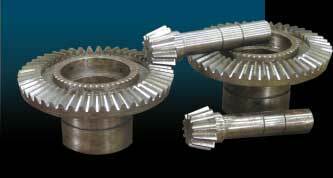 We are the renowned Manufacturers and Suppliers of quality Spiral Bevel Gear with Helical Teeth. The Spiral Bevel Gear offered by us is basically used in a vehicle differential, where the direction of the drive carried by the drive shaft has to be turned through 90o in order to power the wheels and propeller. The Helical design produces less vibration and noise than conventional straight-cut or spur-cut gear with straight teeth.